If you already have a chlorinated pool and you are considering enjoying the benefits of converting to salt water, it's easy to make the switch. You just need to add a new piece of equipment, a Salt Water Chlorine Generator. These chlorine generators generally only have two main components. The Control Module – This controls the output of power to the Salt Cell. Some models will also give you information like salinity and pool temperature. This unit is usually mounted on a wall or post in close proximity to the rest of the pool equipment. The Control Module is designed to be mounted outside in the elements. 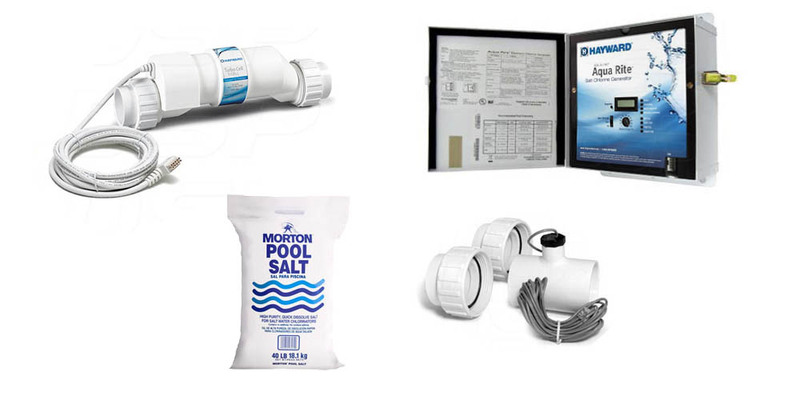 The Salt Cell – The Salt Cell is going to produce chlorine gas from the salt that is dissolved in your water. The salt cell should be plumbed into the return line coming from your pump back to your pool. It should be the last thing on that return line. Some Salt Cells have an internal Flow Sensor that will detect that the cell is full of water. Flow Sensor / Flow Switch – If your cell does not have an internal Flow Sensor, then your system will also include a Flow Switch that is also plumbed into the line along with the Salt Cell. This is a protective mechanism for the system. If the cell doesn't try to operate without proper water flow; it ensures proper operation with your pump circulation system and protects your equipment. Salt - Once you have installed a saltwater chlorinator, you just add a few bags of salt to your pool. In around twenty-four hours the salt will be completely dissolved (it will be like it was never there). You can turn on the salt pool system and relax as it continuously creates its own pure form of chlorine as the water moves through the plumbing. This process uses electrolysis to separates the chlorine and sodium molecules that pass through the Cell. While this process uses the salt in the water for this process, it does not consume it. Also, while water does evaporate, the salt will not. So, the only time you will need to replenish the salt in your pool, is when you drain, backwash or splash it out.